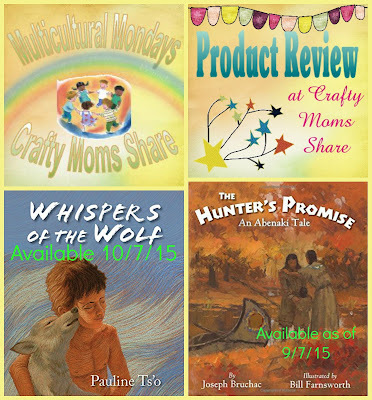 For Multicultural Monday I thought I would share two new books with Native American stories. Wisdom Tales Press is one of my favorite sources for Native American books. 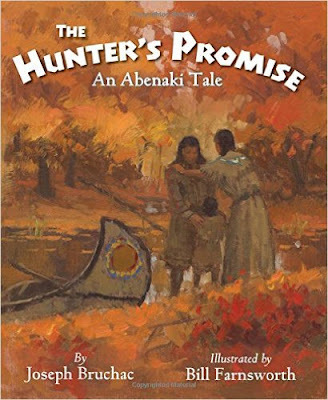 This past week they released The Hunter's Promise: An Abenaki Tale by Joseph Bruchac and illustrated by Bill Farnsworth. The Abenaki lived in Ndakinna (our land). It extended across most of northern New England, southern Quebec and southern Canadian Maritimes. They had many wars with the English colonists and fled to Quebec. The Abenaki were a patrilineal group and each man had a hunting territory which was passed down from father to son. They lived in extended family groups. In the summer most lived in dome shaped wigwams and in the winter they would move inland and live in conical wigwams (similar shape to the teepees of the Plains Native Americans). 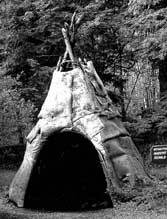 They would line the conical shaped wigwams with deer and bear skins for warmth. Some also lived in long houses. The hair style of a male would tell his marriage status. Men traditionally had long hair and wore it loose. When he found a girlfriend he would wear it in a ponytail and when he married he would shave all but a ponytail. The Abenaki were a farming society who supplemented their crops by hunting and gathering. The men usually were the hunters. The women tended the three sister crops (corn, beans and squash or pumpkins). Storytelling was very important in the Abenaki culture. It was not only for entertainment, but also to educate. 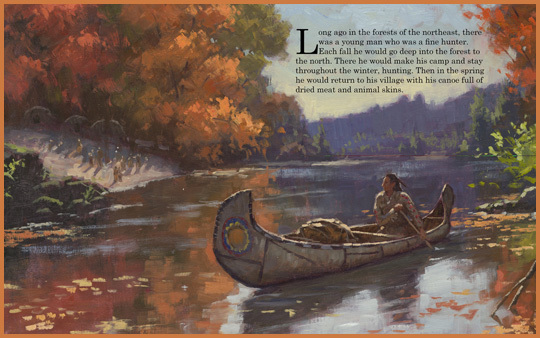 (Source) The Hunter's Promise is a retelling of a traditional Abenaki tale. The tale is about a great hunter who would make a camp and hunt all winter. He always wished he had a partner. One winter he found someone was taking care of him while he slept and/or hunted. He discovered it was a woman. When it was time for the hunter to return home to his tribe the woman asked him to promise to remember her and then disappeared into the forest. When he returned home his parents were so happy to see all the meat and skins he brought back and his father told him he had found him a wife. The hunter shook his head and refused. The next winter when he returned to his camp he discovered his wife had their son. Their son grew at an amazing speed and by the seventh morning was a grown man. He began to hunt with his father. At the end of the winter the wife asked him to promise to remember them and then the mother and son went off into the woods and the hunter returned home. This time when he returned home the village chief was very impressed and asked the hunter to marry his daughter. The hunter shook his head and refused. The chief's daughter however was determined to marry the great hunter and used her spirit helper to erase his memories of his wife and son. He then married the chief's daughter but he no longer smiled. I do not want to ruin the end of the tale, so I am going to stop there with my synopsis. The book has beautiful illustrations and the story is a wonderful tale with love and deceit and all the great things of stories today. We really enjoy this book!! 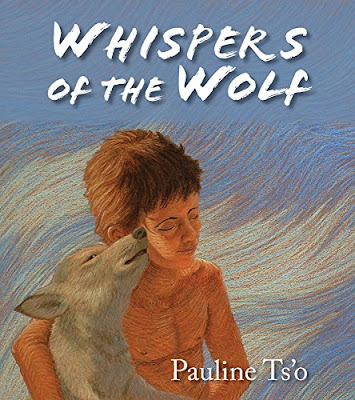 Our second book today is Whispers of the Wolf written and illustrated by Pauline Ts'o. It is being released on October 7, 2015. This is a story of the Pueblo Indians. In the author's note she states that she chose to write this story about people who could have existed instead of the mythical figures of traditional tales. She placed the story in pre-contact with the Spanish in the Rio Grande area of New Mexico. 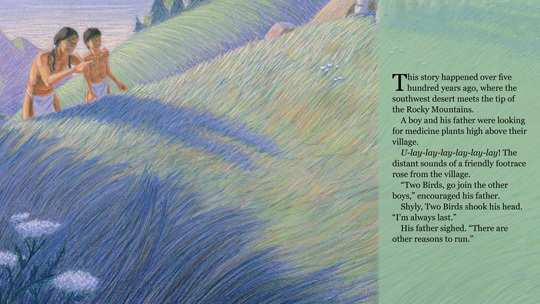 This beautifully illustrated book tells the tale of a shy boy who finds a sick wolf cub and tends to him and raises him. The wolf brings the other boys attention and friendship. Eventually the time comes when the wolf needs to return to the wild and the boy needs to stand on his own. He fears he will lose the friends since the wolf was why they wanted to be near him originally. It is a wonderful tale of a young boy finding his place among his peers. Hazel and I really enjoyed reading this story!! It is one she could really relate to as the shy girl that she is.